The two semi-finals have taken place in the Men’s basketball tournament in the 2016 Rio Games and we know who is heading to the Gold Medal match on Sunday. We also know the two teams who will contest for the Bronze Medal on Sunday, and the two semi-finals managed to live up to their billing. There were 6 points in it but the United States managed to claim their spot in the final, ending Spain’s run in the tournament for the third Olympics in a row. The last two occasions have been the Gold Medal match but this occasion was the semi-final, meaning both teams have one more game to play. 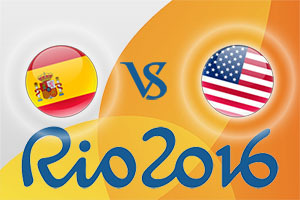 For Spain, they play with the aim of grabbing third place and the Bronze Medal on Sunday while for the United States, they need one more win to claim another Olympic Gold. Few will bet against them finishing the job by the end of the weekend. Pau Gasol provided 23 points in the defeat for Spain while Klay Thompson delivered 22 points for the American side in the win. The United States came firing out of the blocks, taking the first quarter by 9 points but the Spanish side refused to buckle. The Europeans claimed the second quarter by 3 points and the score at the break was 39 – 45 in favour of the Americans. The second half followed a similar pattern. The US taking the third quarter by three points and the Spanish side taking the fourth quarter by the same three point margin. It was close but the level nature of the second half ensured that USA would march on. There was actually a wider winning margin in the Australia v Serbia game which Serbia took control of. A 26 point margin of victory in a semi-final should always be lauded and Serbian confidence will be high for Sunday’s final. It is a crushing blow for Australia and they may struggle to bounce back on Sunday in the Bronze Medal game. A huge defensive performance in the opening half set the tone for Serbia’s win with Australia only grabbing 15 points in the entire first half. A 5-16 score in the opening quarter and then a 9-19 score in the second quarter ensured points were hard to come by but the 24-35 lead at half-time was a tonic for Serbia. 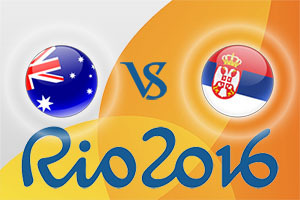 The third quarter nearly matched the first half, Serbia taking it 24-31, giving the Europeans a good lead to hold and although Australia took the final quarter by two points, there was no comeback. Patty Mills was once again the key player for Australia, delivering 13 points although this was matched by Brock Motum. For Serbia, Miloš Teodosić grabbed 22 points, helping them on to victory. Saturday will be a day to rest bodies and strengthen minds before the climax to the 2016 Olympic basketball tournament in Brazil on Sunday.